Sign-up to receive periodic discounts, updates and special offers. *Name What's your first and last name? *Address What's your street address? *City What city do you live in? *State What state do you live in? Is your computer starting more slowly or responding more sluggishly than it used to? Your computer may need routine maintenance or worse may have fallen victim to virus or malware infection. 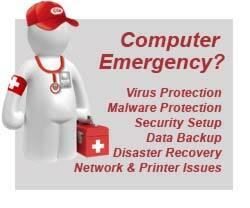 Our Technology Experts can promptly diagnose and restore your PC in your home or business - guaranteed. Your business is built on critical data stored on your computer. If lost or stolen, replacing that data may be impossible and at the very least time-consuming. Don't wait until it's too late. Our experts specialize in disaster planning and data storage. 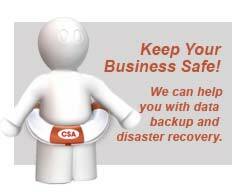 We'll evaluate your data backup needs and recommend a practical strategy to prevent catastrophic data loss. If you've already lost important data, we have specialized data recovery tools.